Vinh is Partner, qualified Patent, Design and Trademark Attorney and Head of Intellectual Property Department of BROSS & Partners. He has more 15 years of intensive experience in advising and representing regional and international industrial and commercial groups on the spectrum range of Intellectual Property Rights related issues, especially Patent, Industrial Design, Trademark, Copyright and Trade Secret. Before jointly forming BROSS & Partners, Vinh had worked for some prestigious local law firms in Vietnam, where he earned valuable knowledge and experience in Intellectual Property, IP Enforcement, Technology Transfer, Dispute Resolution and Litigation. 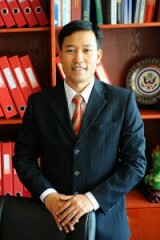 With his intensive experience accumulated for the duration of holding key positions in those prestigious IP local law firms, Vinh had successfully passed the Vietnam Patent and Trademark Agent Qualifying Examination in 2005 and officially recognized as registered Patent, Design and Trademark and Copyright Agent. Vinh has now been advising and prosecuting thousands cases or applications of both international and domestic clients for registration of trademark, industrial design and patent in Vietnam and other countries. Under the authorization of the International Trademark Association (INTA), Mr. Vinh, on behalf Bross & Partners, successfully moderated a roundtable conference titled “Overlapping Protection of 3D Marks, Industrial Design and Copyrights” held in Hanoi, Vietnam on April 10, 2014 with the participation of the representatives of the National Office of Intellectual Property (NOIP), the Copyright Office of Vietnam (COV), the academia coming from the Hanoi University of Law, the National Economics University, the Foreign Trade University and a number of IP practitioners working for international IP law firms and local IP law firms. He is also a regular contributor to the World Trademark Review commenting on the practical and statutory issues regarding trademark enforcement and anti-counterfeit goods in Vietnam. Vinh had taken part in advising and directly representing one of the top 4 Vietnam largest auditing companies, Deloitte Vietnam, a member of Deloitte Touche Tohmatsu Limited which is an international and multi-national firm specializing in audit, consulting, financial advisory, risk management and tax services to request Vietnam enforcement authorities to stop and handle infringement such illegal use and registering domain name, use of trademark without permission and other unfair competition acts. Vinh is also now representing Deloitte Vietnam to protect its trademark under the Madrid system and some other countries in Asean region. Besides, Vinh has also involved in successfully dealing with various contentious and non-contentious matters, including trademark and industrial design infringement, trademark related revocation, opposition and refusal in Vietnam. In 2005, he successfully represented in defending a Vietnam software outsourcing company against the business secret and copyright infringement allegation made by US software producers. Invited Speaker, Asian-Pacific Broadcasting Union (ABU), the 38th ABU Programme Committee meeting,"Copyright Session, Protection of Format Copyright", Hanoi (November 23, 2005).